Indian Mounds. 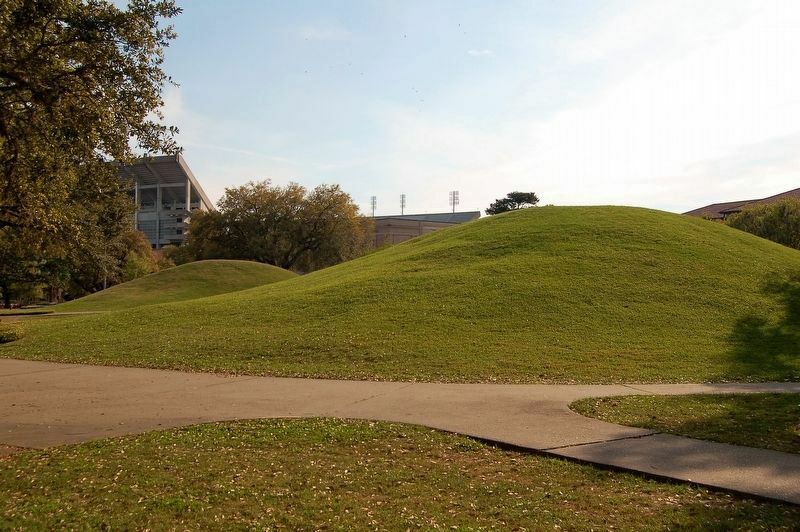 (LSU Campus Mounds)—. . The two large earthen mounds, traditionally known as the Indian Mounds, are among the oldest man-made edifices in North America. 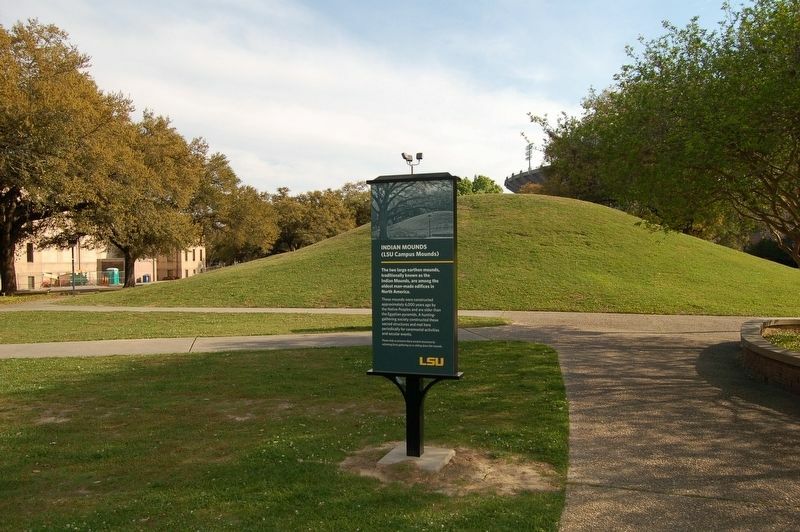 The two large earthen mounds, traditionally known as the Indian Mounds, are among the oldest man-made edifices in North America. These mounds were constructed approximately 6,000 years ago by the Native Peoples and are older than the Egyptian pyramids. A hunting- gathering society constructed these sacred structures and met here periodically for ceremonial activities and secular events. Please help us preserve these ancient structures by refraining from gathering on or sliding down the mounds. Erected by Louisiana State University (LSU). Location. 30° 24.908′ N, 91° 10.933′ W. Marker is in Baton Rouge, Louisiana, in East Baton Rouge Parish. Marker is on Fieldhouse Drive east of Dalrymple Drive, on the left when traveling east. Touch for map. Marker is in this post office area: Baton Rouge LA 70803, United States of America. Touch for directions. measured in a direct line); Steve Van Buren (about 800 feet away); Jim Taylor (about 800 feet away); Y.A. Title (about 800 feet away); Bob Petit (approx. 0.2 miles away); Troy H. Middleton (approx. 0.2 miles away); The Louisiana State University (approx. 0.2 miles away). Touch for a list and map of all markers in Baton Rouge. More about this marker. This marker replaced an older metal marker at same location. More. 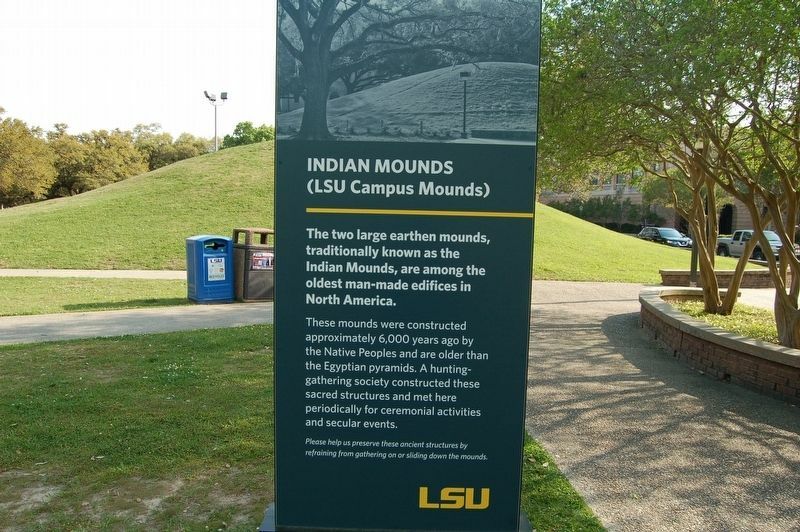 Search the internet for Indian Mounds. Credits. This page was last revised on March 31, 2019. This page originally submitted on March 31, 2019, by Cajun Scrambler of Assumption, Louisiana. This page has been viewed 91 times since then. Photos: 1, 2, 3. submitted on March 31, 2019.